The title of this post sounds like a good movie. I’ll see if I can get Francis Ford Coppola to pick this up. I’ve been ruminating about this post for a while, and no doubt the memory of this greatest par I’ll ever have will be with me until I pass on. The location, the crowd, the hole, the weather and my caddie could not have been more perfect for this story. It is almost unreal. Stories this good can’t be made up. My group of buddies (my best bud Big Al, Shanego, Toad and myself) are on our 2nd fantastic round at The Old Course in St. Andrews, Saturday morning, the 2nd of July 2011. We’d played the Old for the first time the previous evening and came back to play it again within 15 hours. We were quite lucky to manage two rounds on the Old in such a short time. We’d talked to a group in a pub who had been there for four days and had yet to play it. Obviously the golf gods were looking out for us. As was the case on my evening round at the Old the day before, my good friend and caddie John Boyne of Caddie Golf Tours was on my bag. John is a brilliant caddie and an even more of a gentleman. If you’re traveling to St. Andrews for golf, you must have John on your bag as well as enlisting his company to help you with your trip’s arrangements. Your experience will be its best with John’s expertise. I was excited to tee off at 7:10am on the Old Saturday morning, as we’d gotten a little bit of sleep the night before (very little though), and had broken ourselves in a “wee bit.” I knew a little more what to expect and had more confidence in where I was going with my shots. I’d also started to build up my Scottish swing arsenal of low running shots and putts from far off the greens. There’s something special about teeing off on the 1st hole at the Old, and both times I did it on the trip I managed a good poke in the fairway, leaving 8-iron and then wedge approaches. My golfing partners all managed excellent tee shots as well. The Old course starter was impressed. The round proceeded well, barring that damn 4th hole which I doubled a 2nd day in a row. Just like my buddy Shanego’s tough time going into Shell Bunker both days, I want to get back to the Old just to see if I can manage better than a double on that bugger #4. Despite that double I knew I had a chance at my goal of breaking 80 on the Old Course if I could just keep it together and not have any meltdowns or close relations with gorse bushes or those hellish bunkers with the riveted faces. I was controlling my ball fairly well, hitting solid drives and not making too many mistakes. Coming home from about hole 13 the Old course really grows some teeth. The easiest hole on the stretch of 13-18 is in my opinion the 18th. I figured I could manage par on 18, but the damage could take its toll before I even got there. I needed to really play well from 13-17. By the time we arrived on the 17th tee I was very confident. I was six over par and playing well. If I could just make par on the final two holes I’d shoot a satisfying 78. One minor problem with that theory though, was that I’d have to make par on the Road Hole, the most famous hole in golf. Not an easy task on this 460 yard par-4 from hell. This hole has been regarded by many as the hardest hole in championship golf. The Road Hole green isn’t quite like the the rest of the greens at the Old Course. It is narrow and small. The green is also elevated in a manner that penalizes shots which are short or long, left or right. The day before I’d gone over the green in three and had to chip from the bank behind the green while standing on the road. I’d made a decent up-and-down for bogey. Other than the narrow green there are three other daunting challenges in the green complex: the road, the OB wall and the Road Hole bunker. Bringing any of these into play could mean bogey or worse. Goal killers. None of those daunting greenside challenges means a thing if you can’t get off the tee. That tee shot is no bargain. A solid drive needs to go over the corner of the Old Course Hotel, a blind shot. From the 17th tee you really can’t see any of the fairway. Having played the hole only once, I really had no idea how much of the corner to cut. For years I’ve heard the talk about which word or even a letter to aim over in the words “Old Course Hotel” on that daunting black wall. Glad the glass is bullet proof! I wasn’t as nervous as I thought I would be at that point and hit a solid shot which did fly over the letters I’d chosen. But there was a fade spin on the ball going into a headwind. Headwinds magnify ball spin. I watched the ball fade right, easily passing the main structure of the hotel. There were people standing on their balcony several floors up and I watched their heads turn. Then I heard a very disturbing sound, the sound of my ball hitting something hard. A gentleman in on the balcony yelled down, “you’ve hit the Old Course Hotel Conservatory.” I didn’t even know what the conservatory was, but I figured it was that white glass building next to the fairway. I’d gone out of bounds. I dejectedly walked a bit with my head down past the corner, then looked out to see what my 1st ball had hit. The whole damn building was glass. I was starting to worry I’d be on the hook for some replacement glass, but was told the glass in the observatory was bullet proof. Lucky me I guess. There was a tiny bit of hope that my ball hat hit and bounced into the field of play, but a short search proved fruitless. My 2nd ball was in the fairway, 176 yards from the front of the green. At the Old, all yardage markers are to the front of the green. The pin placement was +20 just above a large tier on the front of the green. John told me the shot was 196 to the pin. We had a head wind which was 1-2 clubs, so he handed me my 21 degree Bobby Jones hybrid which I’d hit well to that point. My hope now was to somehow make par on my 2nd ball and scrape a double bogey out of the hole. I pulled the trigger on the Bobby Jones and lifted out of it slightly, which produced a bit of a thin shot. The ball took off on a good line, but with a very low trajectory. We couldn’t see very well, but I told John that we’d be looking at a shot from the road, over the green for the next. It was happening. Golf Chernobyl. I was melting down on the Road Hole, crushing my hopes of breaking 80 with two swings. I’d be lucky to make a double at this point. Behind the green is of course the road. That road is walked by many townspeople, even during the course of play. There were 10-15 people standing behind the green watching play as we walked up to the green. I walked up the front tier looking for my ball. Not seeing it short, I was sure it would be near some of the people behind the green on or near the road. Perhaps my ball might have even been next to the wall where Tom Watson ended up in the 1984 British Open. I looked at the flag and saw something odd though. There was a something shiny at ground level next to the pin. I walked closer and it became clear that there was a golf ball lodged between the pin and the putting surface. The top of the ball was perhaps 1/8 of an inch above the surface. The wind was blowing the pin toward the ball and holding it at surface level, though the ball was clearly in the hole. I was sure my ball was over the green so I walked to the back of the green looking for it. When I didn’t find it I immediately began surveying where my three friend’s balls lay. When I saw them all standing by their golf balls surveying their shots, it dawned on me that the ball in the hole could be only one person’s, mine. I walked up and looked at the ball and sure enough, it was. I turned to my friends and said “it’s in the hole.” Then I turned right to my caddie John and said, “that’s a hell of a bogey.” John looked me straight in the eye and with his fairly heavy Scottish accent said, “its no’ a boogey. Its a pah.” The people behind the green asked, “did you hole out for eagle?” and I responded, “no, a par from 196.” It hadn’t dawned on me just yet how amazing it was. My best bud Big Al came up to me and said, “that is the most incredible par I’ve ever seen. That’s greatest par you’ll ever have and to do it on the Road Hole?” Al then explained to the gallery that I’d made par after hitting the observatory and having to hit a 3rd shot off the tee. They were very entertained and very congratulatory to me. What a cool town (sorry, “toon”) St. Andrews is. I’m sure those people told their friends of the amazing par that evening at the pubs. Ever heard of anyone hitting the Old Course Hotel, going out of bounds, hitting their third shot from the tee and making par on the Road Hole? I did it. With a new lease on life, or at least a new lease on breaking 80, I felt very confident on the 18th tee. The 18th at the Old Course has possibly the widest fairway I’ve ever seen, if you allow yourself to go left and use #1 fairway as well. If you can’t find short grass on this hole, you’ve hit a terribly poor shot. Yes there is OB right where there are some of the town’s golf clubs, residences and a couple of golf shops like the Old Tom Morris shop. But with all that room left, there’s no excuse for going OB right. Some people have a bit of fear on the 18th, but both times I played it I didn’t. Both times I hit solid drives. The first time my ball came to rest on the road which crosses #18 and #1 called “Granny Clark’s Wynd.” On the tee this time, following the greatest par I’ll ever have, John told me to aim for the clock on the R&A building. I said “Okay. Let’s birdie this thing.” I hit a laser beam drive straight at the clock. This time my ball was just a few feet short of Granny Clark’s Wynd, as we did still have a bit of a head wind. While walking up to my ball, my buddy Big Al started to document the round with his GoPro video camera. See the video below. When we got to my ball, John didn’t even give me a yardage. He just handed me my 7-iron. I didn’t ask what yardage it was either. If he gave me the 7, I knew that was the right club. I put a solid swing (for me) on the ball and I felt a nice trap between my club face and the hard links soil. I knew I’d hit it good the split second it left the club. The ball flew straight at the back pin. My confidence at this point was just about as high as it had ever been on the golf course. The ball easily cleared the Valley of Sin and landed about 15 feet below the pin. People actually clapped when my ball came to rest. That’s a first. Before I bent down to start getting a read on the line of my birdie putt, John put his hands on my shoulders from behind and said “you’ve go’ a gal’ry. There’s Andy and Sid.” You can see when John tells me in the video above. There are always quite a few people milling about on the 18th, watching players come home. In that crowd was my friend Andy Brown from HomeOfGolf.tv and his world famous bulldog Sid. When it came time for my birdie attempt on the 18th, in the greatest amphitheater in golf, I wasn’t sure of the read. John looked at it from both sides and showed me where to aim, about two holes right-to-left. I hadn’t seen that break and would have surely misread it without John’s help. I putted the ball with perfect speed right on John’s line. I stood up, not sure it would take the break. Late in the roll the ball did, and dropped in for birdie! Andy and Sid clapped. A day I’ll never forget! What a finish. Imagine coming into the 17th Road Hole at six over par, going out of bounds, hitting the Old Course Hotel and somehow finishing with a five over par 77 for the round 25 minutes later. Never thought that would have been possible. Add to that the fact that I did it with three of my best friends and Boynie on the bag, Andy and Sid the bulldog in the gallery. 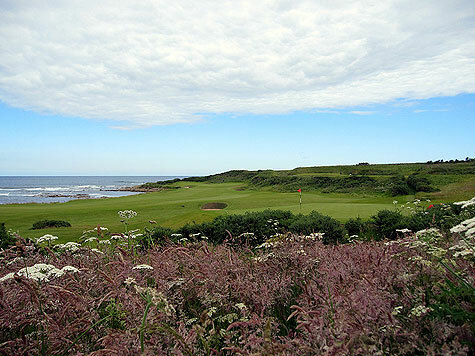 Without a doubt, on July 2, 2011 on the Road Hole in St. Andrews I recorded the greatest par I’ll ever have.